Call me I'm interested in reel. 603 455 8002. Thanks. It is an internal GPS and it really works slick with the navionics Platinum card. Boat is located in Oswego for another couple of weeks and is in the water so you could demo the unit if you wanted to drive over. We would be back from July 19-26th. It would be worth your drive to get to see it all set up and running but that is easy for me to say as it is your drive. My cell is above if you'd like to set something up or have more questions. Yes, it is. haven't finalized a deal with anyone as of now. Tophyhunter, happy to ship to you if you will pay the shipping. My cell is 603-455-8002 if you'd like more information. Lowrance HDS 8 Gen 2 Color fish finder with 8 inch screen. This is the newer Gen 2 model with the high speed processor and user interface which means that it updates what you see faster and the broadband sounder allows you to see fish at up to 3,000 fish clearly even at running speeds. The unit is 3 years old and has been used lightly. I paired this unit with an upgraded transducer (5200) which allows for greater clarity particularly on deeper trolling for Kings than the standard transducer. I upgraded the existing software maps with a Navionics â€œEâ€ Platinum Disk (covering the entire eastern seaboard including Lake Ontario in detail). I have used it on Lake Ontario and it has very nice waypoint and tracking features that have allowed me to get back on the fish after hooking up. New ones are $1,250.00 without the upgraded transducer ($159.00) and Navionics chip ($200) but why spend $1,600 when you can purchase mine for $800. I have the full system from GLP, Tony's product is well made and very functional. I actually brought my boat to him for an install and he did it in very short order to make sure that I got the Boat back in time for me to get my father his first King. You won't go wrong here. Big Jon Dual Planer Board Mast, $125.00. Great shape, works perfectly, has had very little use. Complete system with the exception of the base which is still on my boat. You can create your own base or just order one from Big Jon. These systems new are $285 so you can't go wrong with $125.00. Here is the specs from the Big Jon website: Big Jon's Dual Manual Planer Rigger has been long regarded as "The Industry Standard"; for good reason, it is constructed from high-strength aluminum! The 1 1/2 inch diameter tubing used for the mast has a 1/8th inch wall thickness! You won't find a sturdier mast on the market. 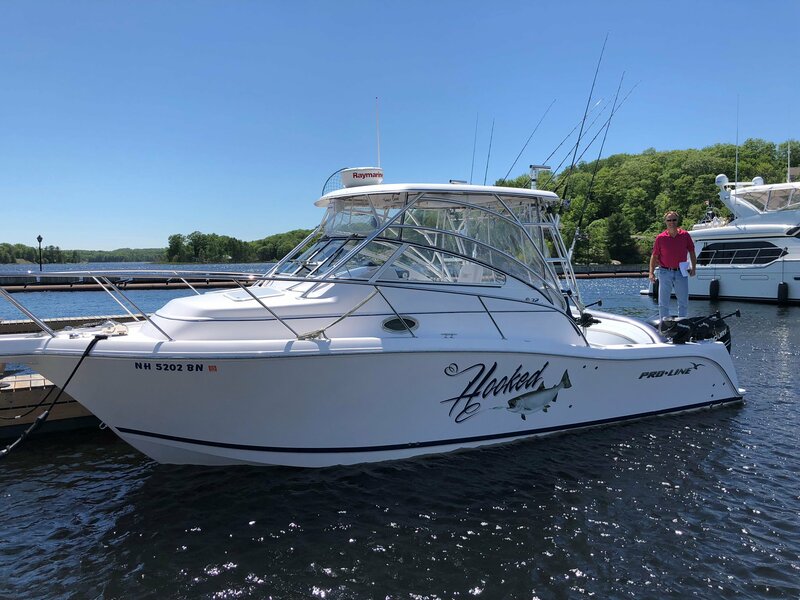 My cell is 603-455-8002, I'll be up fishing during harborfest weekend in Oswego if anyone wants to arrange to come and inspect/purchase the unit. any chance you guys will be able to video the presentation? I can't make it but certainly would be willing to purchase the video at a fair price.